I had about $11 and 41 tournament dollars. Just noticed, my real money disappear. Yeah send them a bugged if you think that the money disappeared without you playing though check with your friends to see if they had access to your computer and played on your account first, just maybe it is not with them. 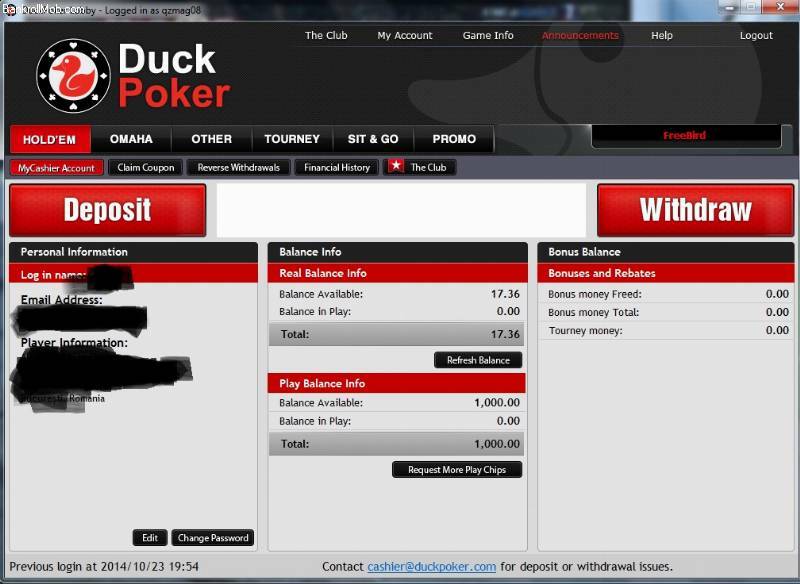 Anyway good luck and hope when you get a response from Duck poker it will satisfy all your worries and you will be good to go and get back your money. Cheers peace out gonna rest a bit the football match before sleep for work! It's only my computer and I didn't play any real money game. 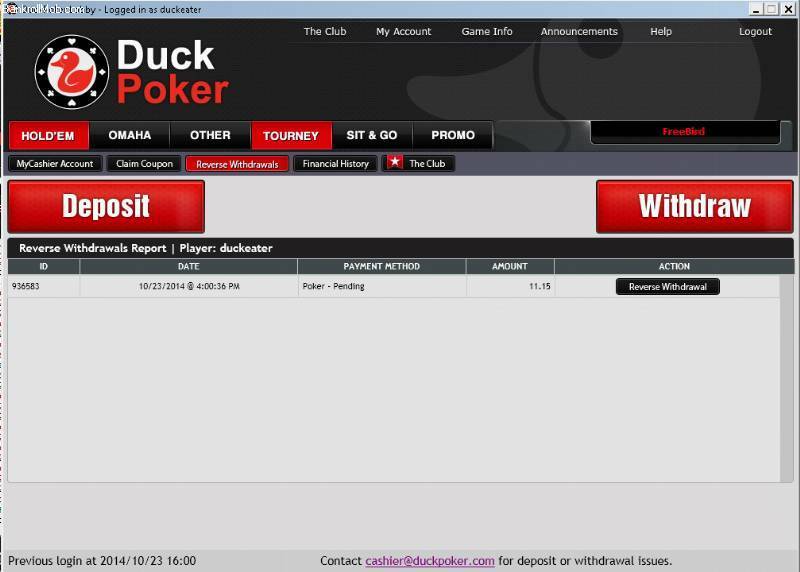 If I play SnG, I always use tournament dollars for buy in. 11$ Withdraw is processing? 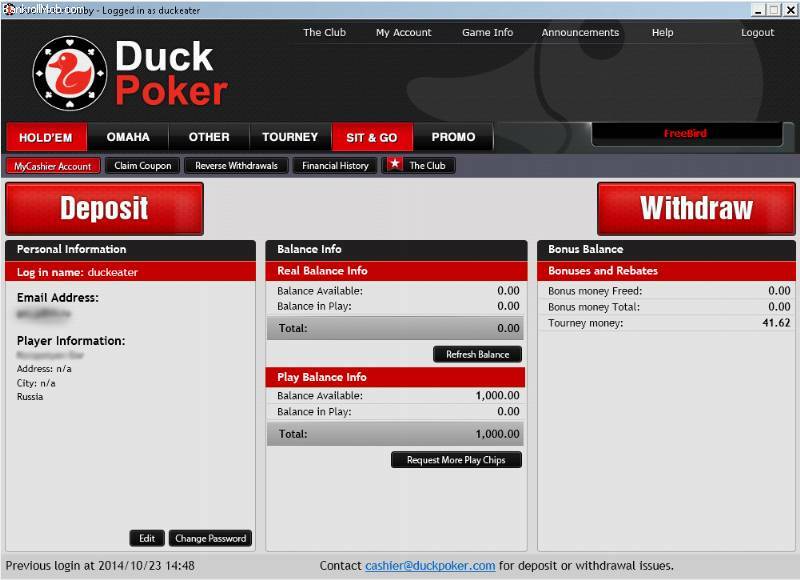 Have you ever deposited before on duck poker? I don't think the withdraw will work and you might lose the money if you haven't met the point requirements before withdrawing ^^ I hope they'll just refund it to you though. How did you manage to initiate a cash out without even knowing? If there are requirements i believe they will just return the money to his account. it dissapear from mine too. So , the bankroll disappeared ? WTF? 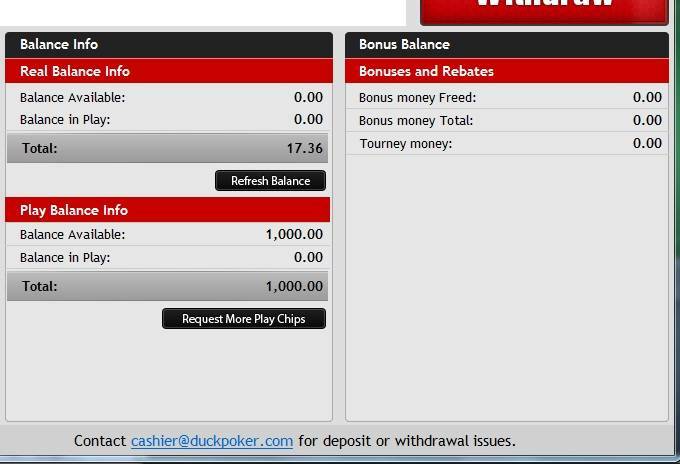 There might be a condition for your bonus that you need to meet before being able to play MTT. Happened to me ones. i wonder ehh, because somehow my balance disappeared aswell, a couple days ago now, think i better type up an email, tell'em im losing a few hundred... hahahah jk... but really im not sure where it went? "Players must earn 30 Player Points before requesting a Free $5 No Deposit Bonus related withdrawal. A failure to earn 30 Player Points in 30 days will result in your bonus being forfeited." The second line there says that if you dont earn 30 points in 30 days your bonus will be "forfeited". Not sure what that means exactly... But I think all players should play some ring games to make atleast 30 points just in case. the money are back in my account, don't know what happened. I made 35+ points so far, so i should be safe. And i should receive another 5 TB at the end of the month. I canceled the request and get the money back to my account. Also I contacted support and they responded.